I've mentioned before that I tend to find reflections quite interesting. No idea when I mentioned that, but I've definitely said it here. Usually that shows up in the form of reflections off the water, because I see those more often and, perhaps more importantly, because I tend to see them when I'm on foot. 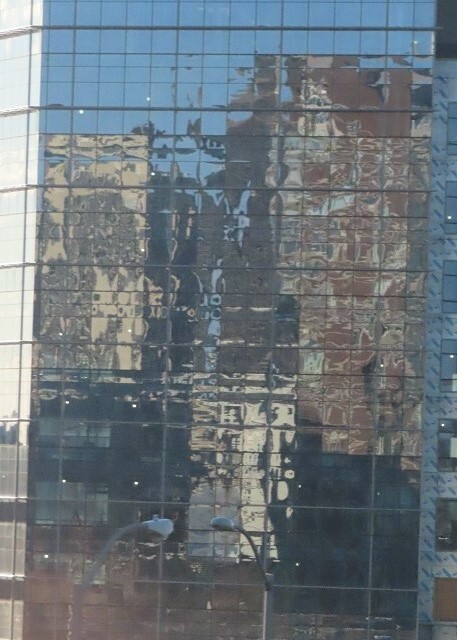 I tend to see reflections off of buildings when I'm a passenger on a bus, which is not an ideal location for photography. Picture taken from the inside of a bus, somewhere on the streets of Boston. In other news, Blogger trying to be helpful by "correcting" the already corrected rotation of this image (and then deciding not to do that when I uncorrected the rotation) meant I ended up uploading it three times.